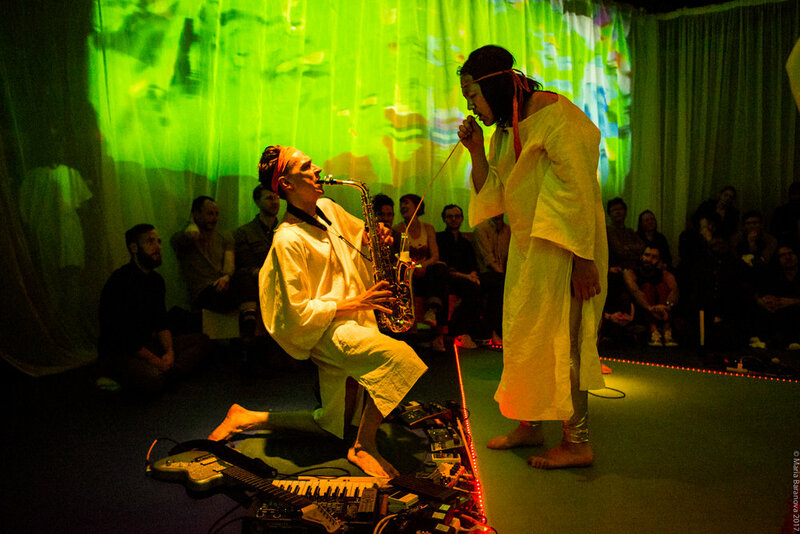 ROKE converts The Bushwick Starr into a psychedelic LUVetarium, hypnotizing the audience with a multimedia psych-rock opera built from sacred texts and online dating profiles. Tei, Sean, and I collaged this piece from publicly-available online dating profiles and messages, including likes, about me, what I'm looking for, and catfishing messages-- as well as a psychedelic stream of American RomCom clips. I staged the piece and co-wrote the score. Sean McElroy and I collaborated to create a playing space in the shape of a giant equilateral triangle with strange chroma-key qualities. I designed the lighting and audio-reactive light effects, and programmed a synchronization system for light, sound, video, strobes, and singers.